LPD010G Features: -Tempered glass shelg. -3 Lockable casters. -Comes with gas cylinder pole. -Fits notebooks up to 17''. 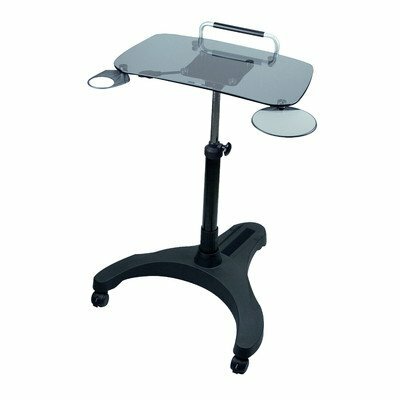 Product Type: -Laptop Carts & Stands. Commercial Use: -Yes. Primary Material: -Plastic. Shelves Included: -Yes. Casters Included: -Yes. Finish: -Gray, black. Number of Shelves: -1. Dimensions: Overall Width - Side to Side: -24.61". Overall Depth - Front to Back: -24.8". Overall Product Weight: -26 lbs. Height Adjustable: -Yes. Overall Height - Top to Bottom: -24.8". Minimum Overall Height - Floor to Tabletop: -28.4". Maximum Overall Height - Floor to Tabletop: -38.6". Large platform 57.5 x 33cm (22.6" x 13") fits notebooks up to 17"